One-bedroom apartment for up to 3 guests. 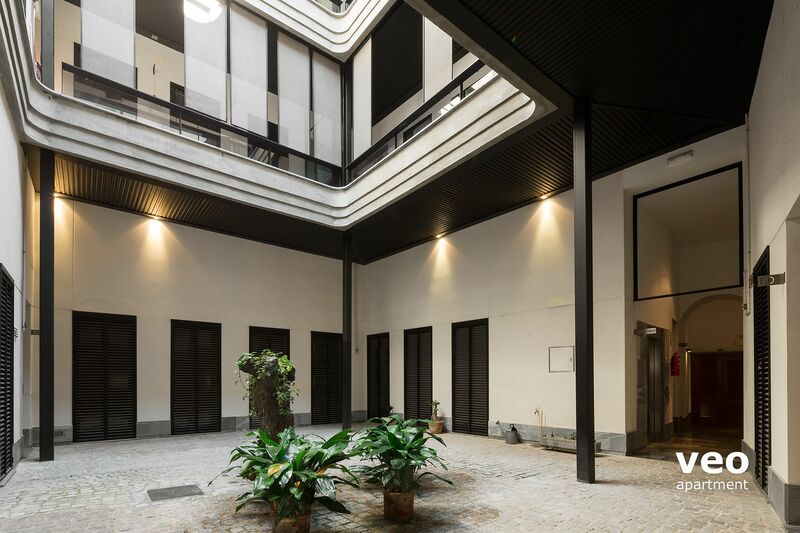 It is centrally located within Seville's historic centre close to the Alfalfa square. 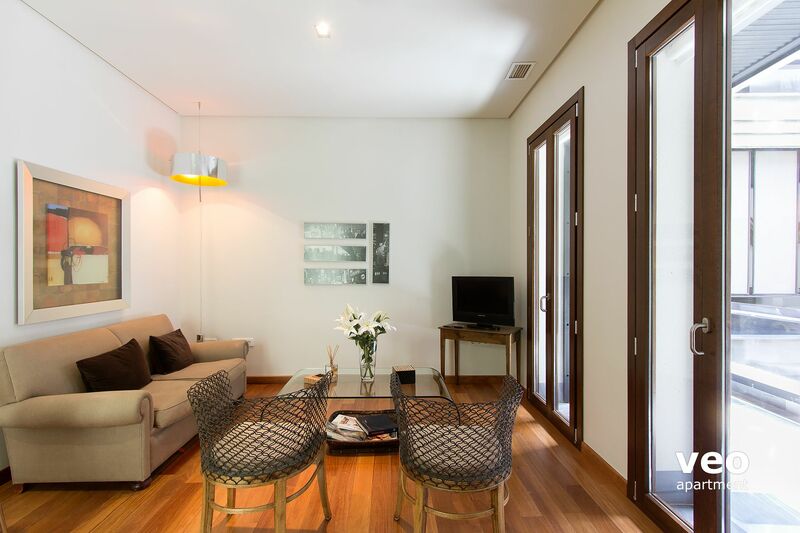 The living area is furnished with a 2-seater sofa (which can be converted into a single bed), 2 armchairs of contemporary design, a central table and flat-screen TV. There is a round dining table and 4 chairs. 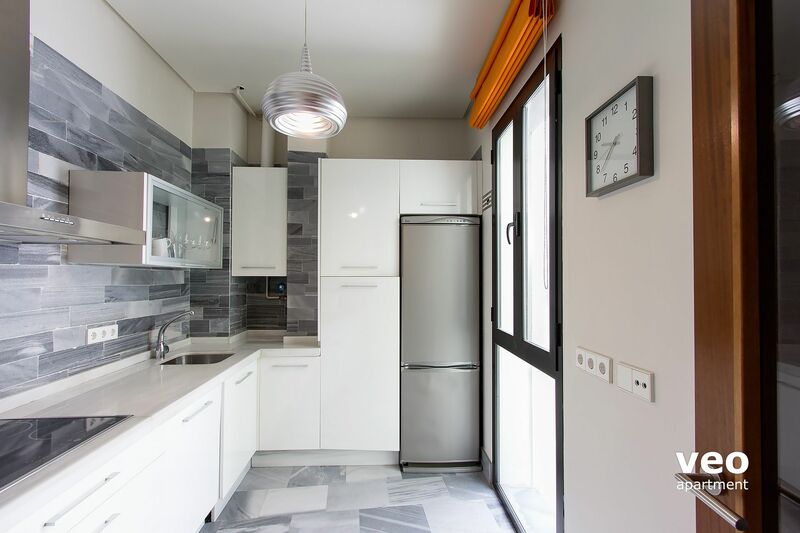 Adjacent to the living room, with a separate entrance, is the well-equipped kitchen. Appliances include: dishwasher and washing-machine. 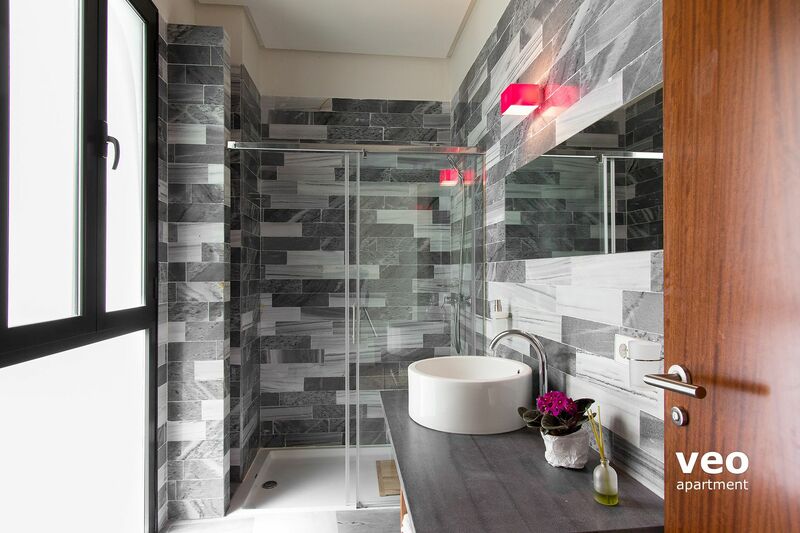 A corridor leads to a superior, marble-lined bathroom. 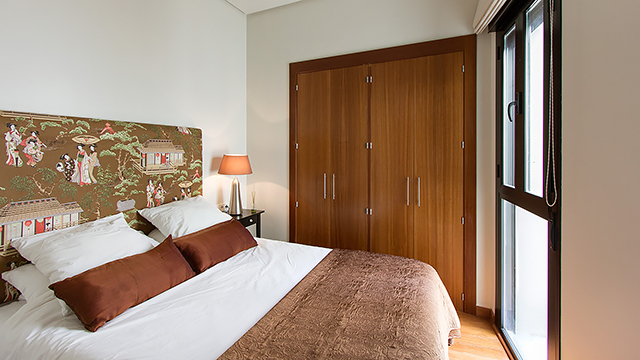 Beyond is the bedroom with a double bed (150x200cm) and a large built-in wardrobe. 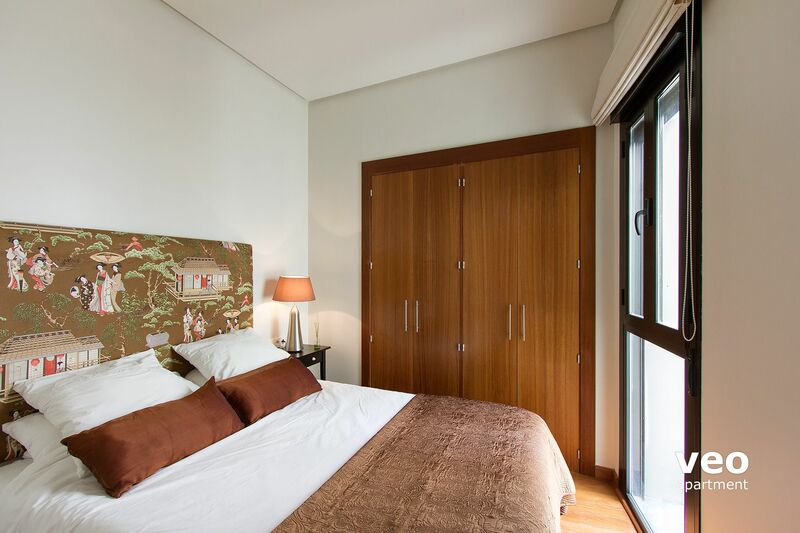 Other features: air-conditioning (hot/cold), free wi-fi internet access and wooden flooring throughout. 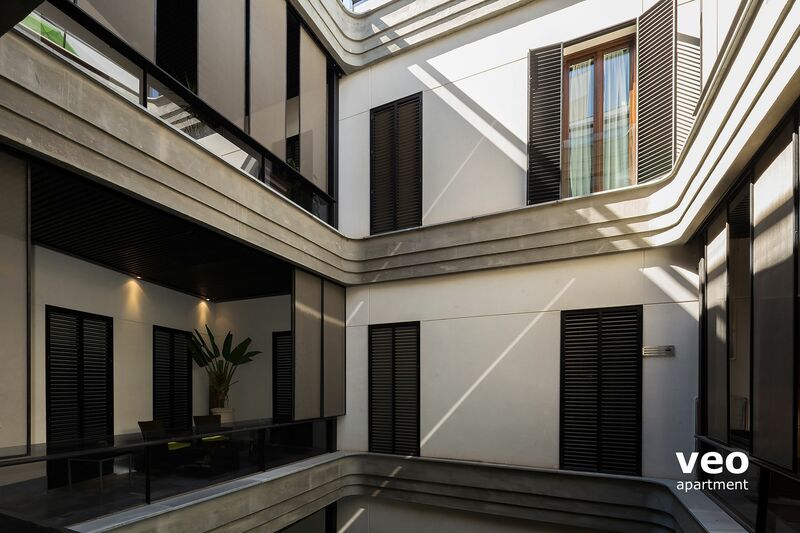 The apartment is orientated towards the interior courtyard of the building - making it a very quiet place to stay. "Corral Rey 3" is on the first floor of a contemporary residential building built in 2008 with an elevator. 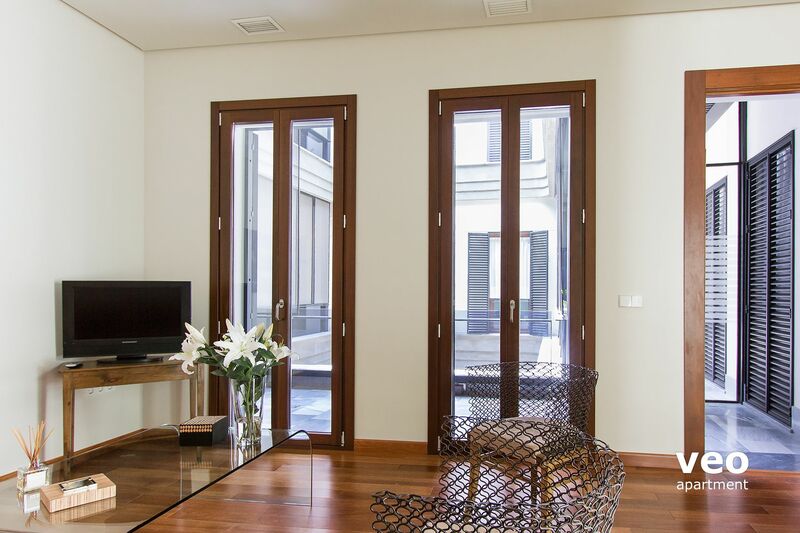 The apartment enjoys a wonderful central location, at just 10 minutes walk from the Cathedral. Wetter eingeschaltet werden, da sich die Räumlichkeiten wegen dem Innenhof und weiteren Zwischen-Schächten im Schatten befinden. Der Mietpreis für die Wohnung ist angemessen. Im Gegensatz zu den anderen Wohnungen auf diesem Stock, gibt es bei diesem Apartment keinen Aussenbereich mit Tisch und Stühlen, wo man sich hinsetzen kann. "EXCELENTE. Piso muy agradable y muy bien localizado. " EXCELENTE. Piso muy agradable y muy bien localizado. 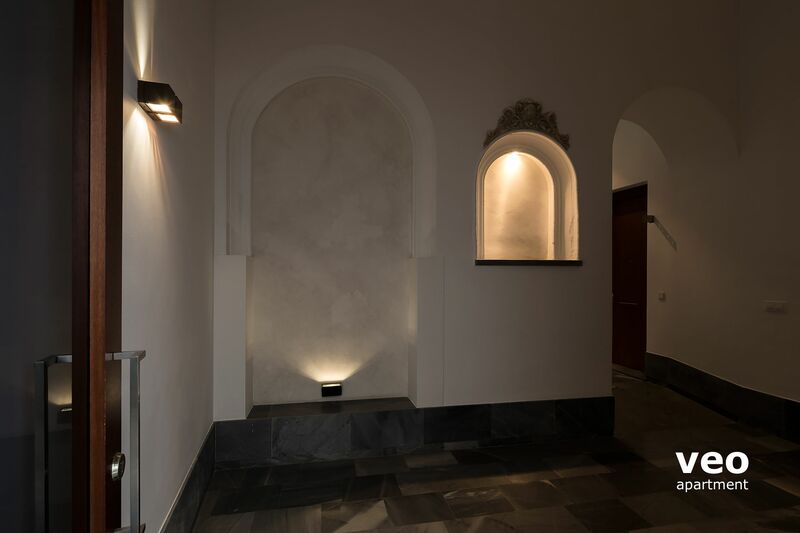 Además el que nos recibió nos informo en todo detalle toda la información y recomendaciones de bares y lugares a visitar cerca del piso. Volveré. Very clean and modern. Staff extremely helpful. We reported a problem and someone came that day. 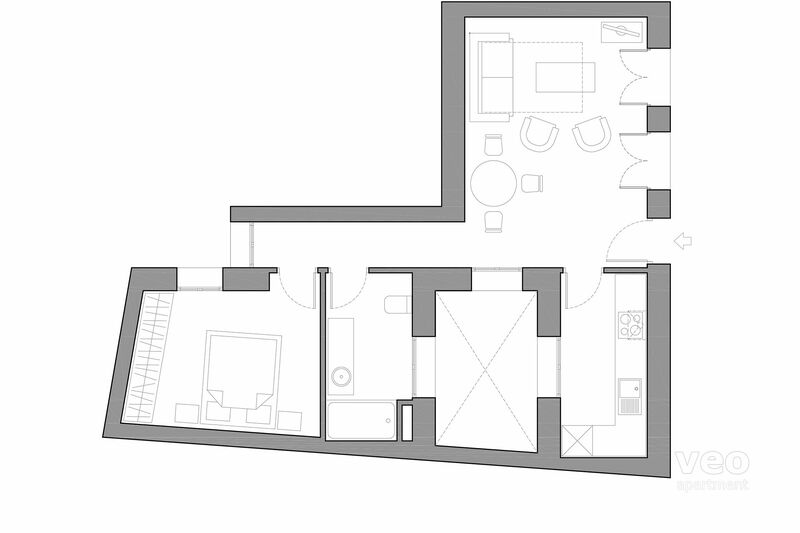 Appartement parfait pour 2. Extrêmement bien situé: En plein centre, à 5 min à pied des monuments principaux, à quelques pas de l'Alfalfa où se trouve une petite place où l'on peut prendre un petit déjeuner extraordinaire. Quartier top. L'aménagement de l'appartement est moderne avec une grande salle de bain et la propreté est impeccable. Nous sommes enchantés. Appartement agréable malgré un manque de lumière . Everything was perfect with the apartment. It was more than I was expecting. Only one very small issue: there is not enough lighting in the rooms. 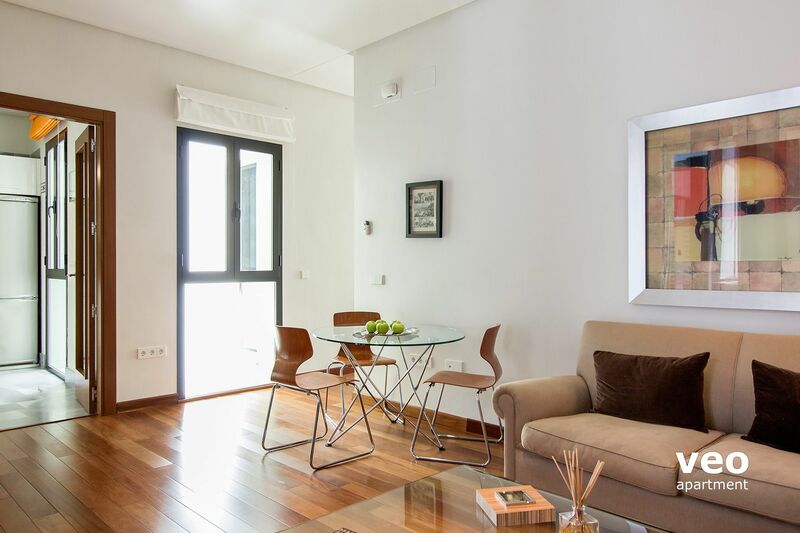 We would be very happy to return to Sevilla and stay in this apartment again. The location was perfect to sights, restaurants etc. The apartment was very clean though a little sterile. Our only concern was the sounds and smoking smell up the courtyard window area. "Nice stay and good location"
Everything was wonderful with the apartment. My only complaint is the smell from the sink in the bathroom. To be fair I didn't complain about it while I was there as I was too busy enjoying my time in the city. I would definitely use this company again. Everything was very professional. "El lugar perfecto en Sevilla." La mejor ubicación, distribución ideal y muy bien equipado. 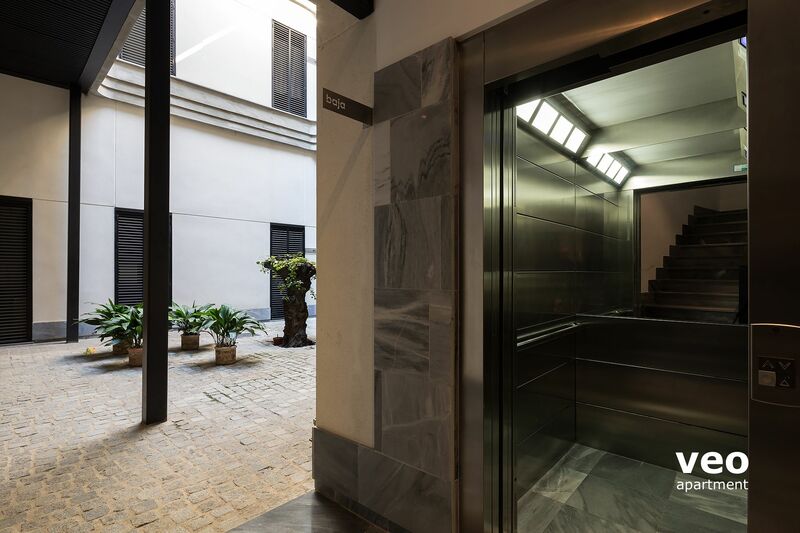 "Awesome apartment & location "
"Muy bien situado y muy tranquilo"
"Ubicación y calidad-precio muy buenos"
location: 5 min to walk to Cathedral, 3 min to the nearest supermarket and Flamenko museum, 1min to the nearest bar. Apartment is clean, convinient and well equipped. there is elevator in building. I can highly recommend it to my friends. "Nice place to stay in Seville"
Everything was good, nice and beautifule apartment in the centre. It was clean and the kitchen and bath room have everything what you need. Estuvimos hace poco pasando unos días en este apartamento y vinimos encantados, la situación es perfecta al igual que la limpieza y el estado del mismo. 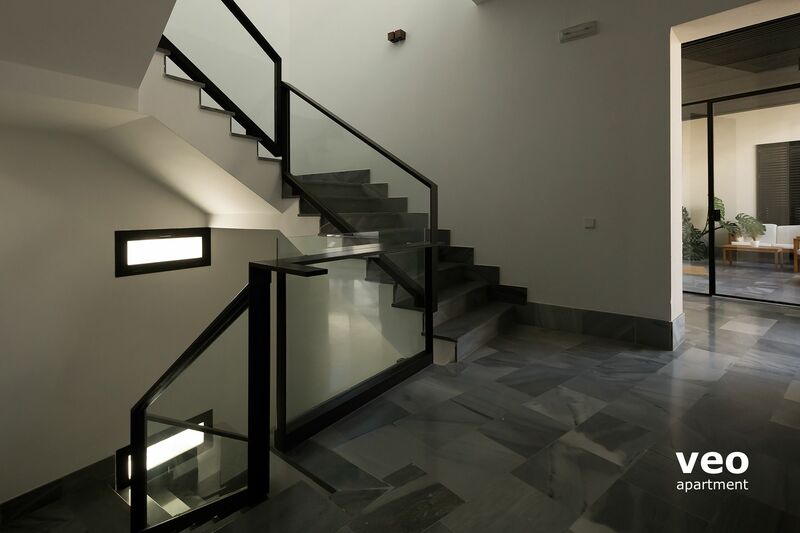 En nuestro caso fuimos con un peque y en estos casos siempre te preocupa mas elegir el apartamento mas adecuado en cuanto a ciertos aspectos, pues estamos encantados con la estancia, con Sevilla, que es preciosa y con la amabilidad de su propietaria. J'avais réservé cet appartement pour mes grands-parents, qui ont été enchantés de leur séjour. L'appartement était très propre, très bien situé, à 2 minutes à pied du supermarché, en plein centre de Séville, et dans un endroit incroyablement calme et reposant. La propriétaire était très agréable et disponible pour quelque renseignement que ce soit. Localización genial y muy tranquila, propietaria muy amable, apartamento muy limpio, 100% recomendable! 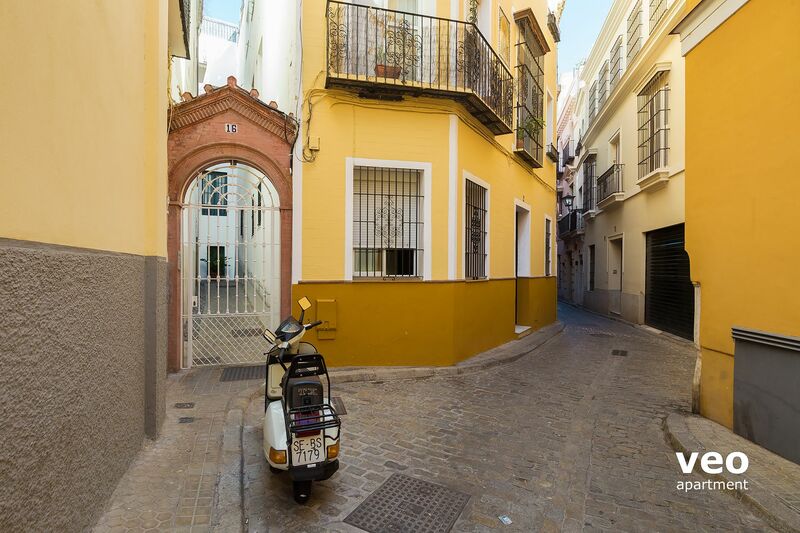 "Fabulous and Quiet Location in Central Seville"
The apartment has a great location and the building is kept secure and quiet. Great air conditioning and appliances, but it would be helpful to have some written instructions on how to use the clothes washer/dryer. (This appliance is very different from what is available in the US) Everything needed for cooking was supplied although there was only one cereal bowl. Comfortable bed except the pillows need to be replaced. Very clean. We were disappointed that the Wifi did not work during all our stay. We contacted the landlord (Elena) about two days into our visit, but although she promised to look into it, it still never worked. (We use a WPA2-SPK secure connection at home and out computer (PC Windows XP) is configured to accept this type of connection.) Having access to WiFi was important for us and this problem forced us to spend too much time finding internet access elsewhere. "Nice layout but Needs New Furniture"
The layout of the apartment was very nice, the appliances were all very nice as well. The location was excellent. The apartment was clean, had many amenities including washer/dryer combo and AC. The only problem we had with the apartment is the bed mattress needs to be changed - it is warn and tends to cave in towards the middle making sleep less comfortable. the dining room table was unstable and the coach was dreadfully hard and uncomfortable. The chairs in the living room were also quite uncomfortable and the TV too small. This apartment needs a desk and furniture upgrade. "Appartement calme idéal pour 2 personnes"
Bien aménagé, emplacement parfait pour visiter le centre historique de Séville. Nous avons particulièrement apprécié le calme et la fraîcheur du logement. Serendipity led us to this great apartment. Location was perfectly situated for all the main sights. Great restaurants nearby, as well as plentiful shopping. Lovely apartment with all modern conveniences, quiet for sleeping, and the property manager was so very kind. Great website - really appreciated the video tour. Prompt and easy communication,. Very good. Seating could be more comfortable. Satellite tv would be appreciated. Loved this apartment, new, well fitted out, very reasonably priced and a great layout. Apartment had everything we needed for our stay. My only complaint was that it was quite dark in the living room, with all lights on, it was still dim light. 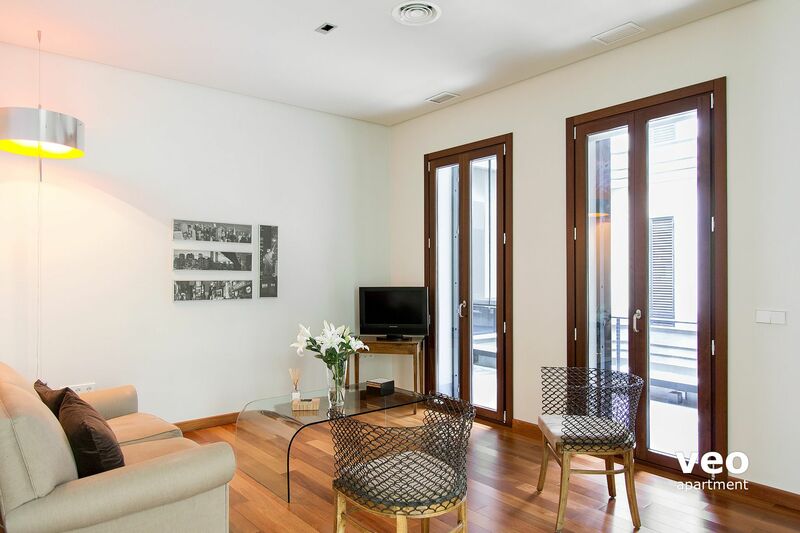 Other than that, it was in a fabulous location in Seville - walking distance to everything. Met the owner and she recommended some restaurants, flamenco shows and museums to visit - even provided a map. Thank you for a great holiday. Très bonne situation, à quelques pas de la place alfalfa avec superette, place de jeux pour enfants, boulangerie. Pas loin non plus des principaux sites de visite, on a tout fait à pied. La poussette n'est pas à prendre car il y a beaucoup de pavé. Nous avons particulièrement apprécié qu il y ait déjà tout dans l appartement comme sel, poivre, sucre et café même de la lessive... Toutes des petites choses qu on doit obligatoirement avoir dans la cuisine mais que l'on doit souvent acheter en arrivant dans chaque appartement. Appartement plutôt sombre car il manquait des ampoules, particulièrement dans le salon-salle à manger et la cuisine. La chambre petite mais confortable bien sombre pour dormir. Il y faisait bien frais, cela doit être agréable en plein été. Il y a que des puits de lumière, il ne donne pas sur la rue. C est TRÈS silencieux. The photo of the bed on the website is deceiving. In the photo it is stretched to look like a large bed. Bed is actually very small and not comfortable at all. It curved in when my husband and I slept in it. If the bed is changed then I would definitely stay there again. Appartement très agréable à la décoration moderne idéalement situé dans le centre historique de Séville. Les amateurs de calme seront très heureux malgré un léger manque de luminosité. "Idéalement situé,propre et bien équipé"
Bel appartement, propre, bien équipé, propriétaire disponible, seul point à améliorer: le sofa-lit qui grince et est très mou. "Good comfort in Barrio Santa Cruz." Location very central and apartment with all the comfort. One of the nicest apartments we have stayed in during our stay in Spain. 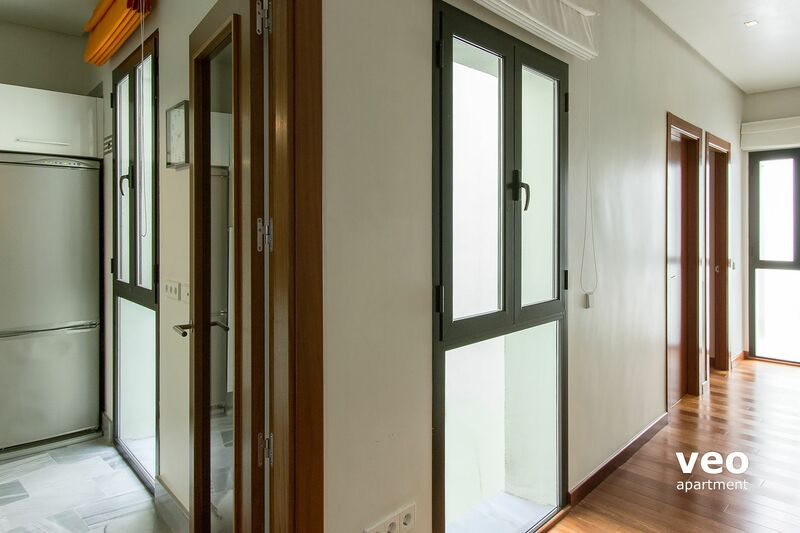 "Modern and clean apartment in excellent location"
A spacious and modern apartment. Bed very comfortable. Chairs in sitting could have been better. Overall excellent value for money. "Superb service, lovely apartment and great location"
Very nice apartment in a beautiful location, clean and with all comforts. Owners very friendly. "It was very nice apartment!" It was very good apartment, it was clean, new, everything was working. Good location, quiet place but still near everything. We liked!